Company Summary: Caravel was established in 1993 as a California C-Corporation (Duns # 96-516-9972). Caravel’s goal is to establish a unique state-of-the-art network which includes internet portals and media publications to promote business, trade, and commerce between global Chinese merchants. With a SOLID foundation and GREAT potential, Caravel is poised for rapid growth and is currently looking for investors (both domestic and foreign investors welcome). Clients: Caravel’s existing clients include Fortune 500 companies, multinationals, import/export firms, government agencies, public libraries, academic institutions, major banks, law firms, and many more. 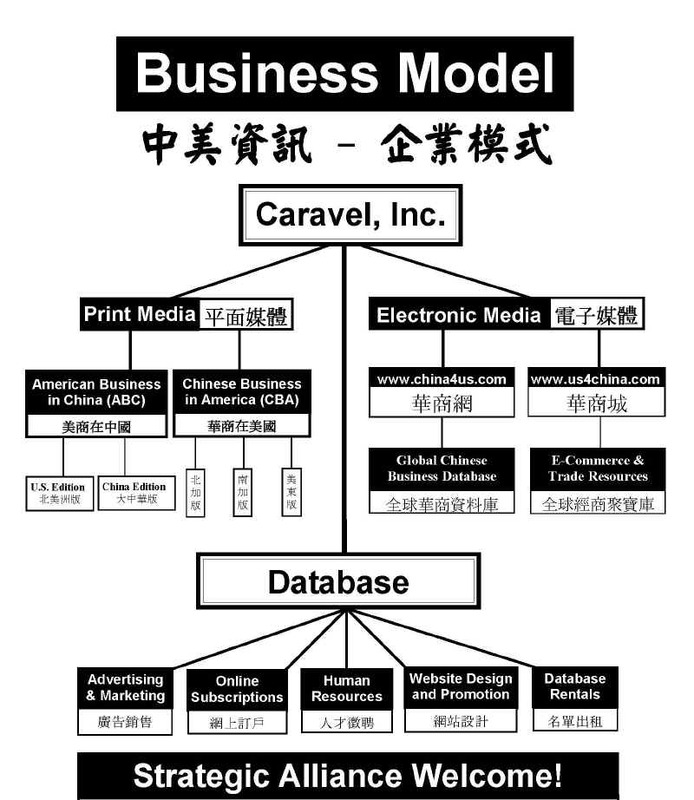 Products/Services: Caravel publishes two print business directories “American Business in China ” (ABC) and “Chinese Business in America ” (CBA), owns/maintains two electronic databases, and operates two websites (china4us.com & us4china.com). The business model is shown on the next page. 1. 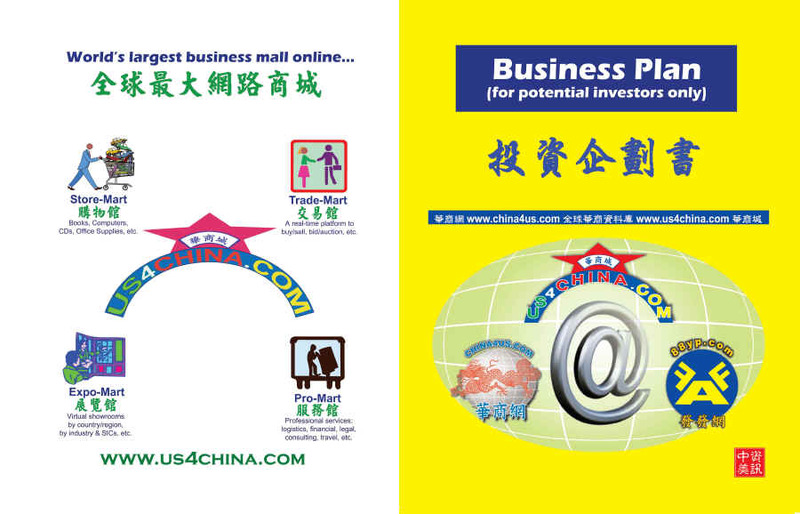 Establishing www.china4us.com (華商網) as the B2B portal/gateway for global Chinese businesses. Its potential competitors include Alibaba.com and Global Sources (GlobalSources.com). language capabilities. Its competitors include Amazon.com and other major e-commerce players. proprietary information are either licensed or bought. barriers and to facilitate trade/commerce for global Chinese merchants under one roof. crucial business decisions. Customized reports may be ordered by paying a nominal fee. visa requirements, while minimize traveling and show expenses. 3. Trade-Mart (TM): It includes a platform where buyers, sellers, and bidders can interact and trade. others can advertise and promote their services. We plan to operate, on an ongoing basis, in strategic partnership with vendors, distributors, publishers, and other internet companies so that we may leverage our resources and maximize our potential. knowledge and information to the venture. Partners may be asked to sign non-disclosure and non-circumvent agreements, where applicable. (2) Co-destiny. Each partner’s remuneration will be tied to the success of the venture. They will agree to revenue-sharing. Partners will meet periodically to monitor and measure progress. Between meetings, partners will network via phone/fax and/or e-mails. Agreements will include an escape clause whereby Caravel can immediately terminate the contract of any Partner that fails to honor their commitments. As of 2007, Caravel has successfully established a number of strategic partnerships/alliances, including publishers, chamber of commerce, governmental trade agencies, etc. company’s success in all areas of operations. Interface with company’s major investors. sales, customer’s support, website development, strategic alliances, etc. research parameters and institute systems for obtaining and processing market intelligence. communications. Supervise the implementation of Caravel’s advertising and publicity plan. Work with marketing professionals to create a corporate identity and brand image. Develop all relevant free and paid advertising opportunities and materials. Tasks: Manage the company’s financial affairs including inventory control and cash management. company’s print publications as well as rentals from company’s electronic databases. will be expanded as justified by growth. Tasks: Independent sales reps will be hired on commission basis to increase company’s revenues. Currently, there are many Chinese B2C internet portals on the web. However, there are hardly any one-stop B2B portals for global Chinese merchants that can accommodate their needs in global commerce. Caravel’s strategy is to fill this gap and help Chinese enterprises worldwide conduct business on a single platform without leaving their countries. By registering as a member of the “Global Chinese Business Database” (GCBD), a company can easily collect essential business intelligence of any country/region from the Store-Mart, buy and sell its products or services online from the Trade-Mart, , rent a permanent virtual show room from the Expo-Mart, and acquire related professional services from the Pro-Mart. One of the main benefits is that member companies can interact with each other in Chinese language if needed. may be downloaded directly from Caravel’s websites. Most print and databases are priced at $88 - $195, which is easily affordable by most small and medium enterprises. Caravel offers customers to advertise on its print and electronic media. Besides, it rents standardized virtual showrooms to virtual exhibitors by different regions and industries. For companies wishing to have their own website, Caravel can also provide the design/host services. Caravel’s BMO will offer its customers the most competitive price. To streamline operations and minimize operating costs, Caravel can forward customers orders to vendors for drop-ship arrangement. Besides, GCBD’s registered members are entitled to additional discounts of the already low prices. providing essential global market intelligence. as Caravel’s Store-Mart. Its website is not professionally designed and navigation is difficult. web, they lack strategies to globally develop the vast Chinese market, including Mainland China .